Der folgende Text von unserer internationalen Datenbank ist in englischer Sprache. 1. Does the software support all previous Windows versions? The software is compatible with Windows 7, 8 and 10 but we do not guarantee or support backward compability with Windows Vista and Windows XP. 2. Is the software compatible with magnification software and screen readers from Dolphin, Issist and AiSquared? Yes, our software is compatible for use together with software from Dolphin v12.03 and forward and AiSquared v10 and forward, on Windows 7, 8, 8.1 and Windows based computers. 3. How do I get the latest update of the software? LVI has an automatic update function in the software; the user gets the latest update for free via the Internet within the running version. When new versions are released, updates are sold separately. 4. What accessories are available? LVI offers three different docking stations: One is with X/Y table in A3 size with friction brakes in both directions, one is with table clamp and the last one is with plate. If you choose a docking station with table clamp or plate you can combine it with the smaller dockable X/Y table MLRT-XY. 5. If my computer doesn’t have an USB3.0 port – will it work? Yes, the system is backwards compatible with USB2.0 standard, but it will of course limit image quality somewhat. You will get a lower resolution output from camera and lower accuracy level when using OCR software. The system will need 2 x USB2.0 ports to power the unit, instead of one USB3.0. USB2.0 Y-cable can be ordered separately from LVI (product code USB2.0-Y). 6. Is it possible to connect a hardware split box? Yes, the system is module based and can be connected to a number of other LVI products. Connect the hardware split box to MagniLink S Premium 2 and split the image between the distance camera, reading camera and a monitor/computer. 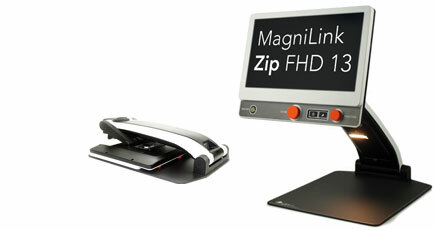 As an option, an external distance camera can be connected as well as a MagniLink S Premium 2 Docking station. 7. Is it possible to capture a snapshot or video? Yes, pictures can be saved and video with sound can be recorded. This means that the user can replay a lesson or other important things. Tip; Use Bluetooth based microphone on the teacher to achieve good sound quality when recording in school situations. 8. Can I connect MagniLink S to my Mac or Chromebook? Yes, the unit will work on Mac-computers, including TTS software. The unit will also work on Chromebook and optional OCR function. 9. Could the MagniLink S be used without computer? Yes, it can be connected directly to a monitor/TV through the HDMI connector. The system is then controlled by either the integrated or an external (accessory) control panel. 10. Are all settings retained after reboot? Yes, if you turn off the system with the on/off button. But if you suddenly pull the cord out or if there is a power outage, the settings will not be saved. 11. Can the integrated control panel be used at the same time as the computer keyboard? Yes, the controls can be used at the same time, this also applies to the external control panel. However, to shut down the system you have to use the application. 12. Is it possible to connect an interactive whiteboard? Yes, make sure that the computer connected (not the computer connected to MagniLink S) to the projector is set to 60Hz, to make sure that there is no interference in the camera picture of the whiteboards. Tip; There are also other ways to connect the students PC to interactive whiteboards by software, please contact the LVI support team to find out how to do (support@lvi.se). 13. What to do if I run XP or Vista on my computer? Upgrade to Windows 7* or later, or buy a new(er) computer (recommended). 14. What to do if I have a monitor with VGA connection? An adapter cable can be used to connect the MagniLink S Premium 2 to a VGA interface. Though it will cause a considerable loss in image quality. Buying a new monitor is a better solution. 15. Will the TTS software run on a computer with USB2.0? Yes, if the computer follows recommended requirements (please see MagniLink S Premium 2 manual) it can be used for OCR/Text to speech. Best image quality such as high frame rate and highest possible resolution will however always be best with USB3.0. .
16. Can I use PCMCIA card USB3 to get USB3.0 in a USB2.0 computer in combination with the unit? We don´t recommend using PCMCIA card. We have tried several computers and we can´t guarantee that it will work. Please use a computer with USB3.0 or use split cable for USB2.0 (see question 5). 17. Can a computer with USB2.0 be used for OCR functionality? Yes, if the computer (PC or Mac, not Chromebook) follows recommended requirements (please see MagniLink S Premium 2 manual) it can be used for OCR/Text to speech. Best picture quality such as high frame rate and highest possible resolution will however always be best with USB3.0. To access OCR for Chromebook you make an in-app purchase in the MagniLink ChromeViewer app. The OCR feature is then connected to the Google Account used for the purchase. This means that you can use ChromeViewerTM and the OCR function at any Chromebook. 18. How do I get the software for my Chromebook? The software for Chromebook, MagniLink ChromeViewer, is easily downloaded from Chrome Web Store. ​Der folgende Text von unserer internationalen Datenbank ist in englischer Sprache. This trial software for MagniLink S / Pro / Vision / Zip is completely free and fully functional for 30 minutes before you have to restart the program again. Please note that the latest versions will be automatically installed if True Update is activated. Choose either the "Full version" for a complete software, including all available languages (note that the large file size can cause significant download time) or the "No language version" (best choice for everyone not using a text-to-speech-model). Users with a Text-to-speech-model can complete the "No language version" with the languages in use. There is also an updated End User Configuration software available for all MagniLink S users. EUC is a configuration program that can individually modify the settings according to the user, for ex magnification (max min), guiding line (colour thickness), curtains, lighting, grey scale and artificial colours. Finding specific settings or sometimes removing functions will facilitate both for the user and the low vision therapist/trainer. Free software from LVI. You will need a USB cable (standard-A plug and standard B-plug) to transfer the EUC software to your MagniLink S. The EUC software and the cable can be ordered from LVI. Bug fix: Fixed a crash when Ipek Turkish was selected with the key 0. Bug fix: Camera picture now returns when running ZoomText and the settings dialog is closed. Bug fix: Some visual improvements in the settings dialog. Bug fix: Alt + Enter caused full screen problems. It has been disabled. Bug fix: Ctrl + C now triggers when C is pressed down. Feature: Added some notifications when SuperNova is running. Feature: Implemented ZoomText multiple monitor support. Bug fix: Improved stability together with ZT 11. Bug fix: Fixed a bug that occurred when ZT was being closed while the MLS software was running. Bug Fix: Changing resolution while running ZoomText now works. Bug Fix: Filter out 720 when running an old MLSTPRO. Bug Fix: Automatic language detection now works for italian language. Bug Fix: When pressing 0 the application now informs the user about the voice switch by reading aloud the new voice. Bug Fix: Fixed and issue in the graphics initialization that will fix the problem with delay in the video. Bug Fix: Fixed a crash an some other issues that occured when the license is changed. Bug Fix: Changing split position with supernova now works. Support for gestures zoom on touch displays. Support for our new product MagniLink PRO, soon to be released! Support for fast resolution changes. Added support for the following languages when used with Sapi voices: Catalan, Czech, Faeroese, greek, Hungarian, Icelandic, Romanian, Slovak, Turkish. General improvements and bug fixes. • Automatic adaptation of the "gaps" between the words - which gives longer break at slow reading speed and short break at faster reading speed. This improves the voice and creates a better audio experience for anyone listening. • Shortcut key to activate MagniLink S window makes it easier to reach the video magnifier. Press F8 to get started directly from a minimized state. • Automatic language detection. MagniLink S can now even recognize several different languages ​​in the same paper. Language and voice are changed instantly, completely automatically. • Possibility to choose any of the fonts installed on the users computer for displaying text in TTS mode. This allows the user to, for example, get text presented with special fonts adapted for dyslexics. • Improved functionality together with ZoomText 10. AiSquared has now refreshed its CCTV interface. This makes ZoomText performance less "heavy" on some computers and ZoomText now interacts better with MagniLink S.
• Column Selector to help the user to choose which part of the paper to be read aloud, for example if the user wants to read a selected column in a newspaper. • Enhanced functionality for video recording. • Select (CTRL + F4) to put text from different scans together in the OCR mode into a single document, which then can be read in its entirety. This along with "Smart Smart" makes scanning extremely fast and feature also works while text is being read out. Upgraded CCTV interface - compatibility with Dolphin SuperNova latest version. Save pictures in different formats, including popular JPEG. Fix for some cameras that had an empty registry file in the camera and therefore couldnot be upgraded. Fix to allow setting of 16 bit color quality, which previously gave a blue camera image with screen magnifier. Fix for incorrect PDF manuals from the start menu. New focus features for MLS Reader such as reading, writing and autofocus are now available. The reading camera was not identified during the installation. When the magnification program and the video recording in full screen were active, no video images was showed on the screen. This problem has been rectified. Video show on some low end computers caused that the application did not start and no error message was showed. New ZoomText interface for Windows Vista with ZoomText version 9.14.2 or later. Update for the new Reader camera (LVI Handcamera v4). Feature to activate and inactivate autofocus. Corrected fault which appeared for SOFT license on Windows Vista and caused that the application did not start.